Club for Growth $1 million Trump attack: Free-market super PAC takes aim at GOP front-runner. Finally, a Conservative Group Is Spending Real Money to Attack Trump. It’s Probably Not Enough. 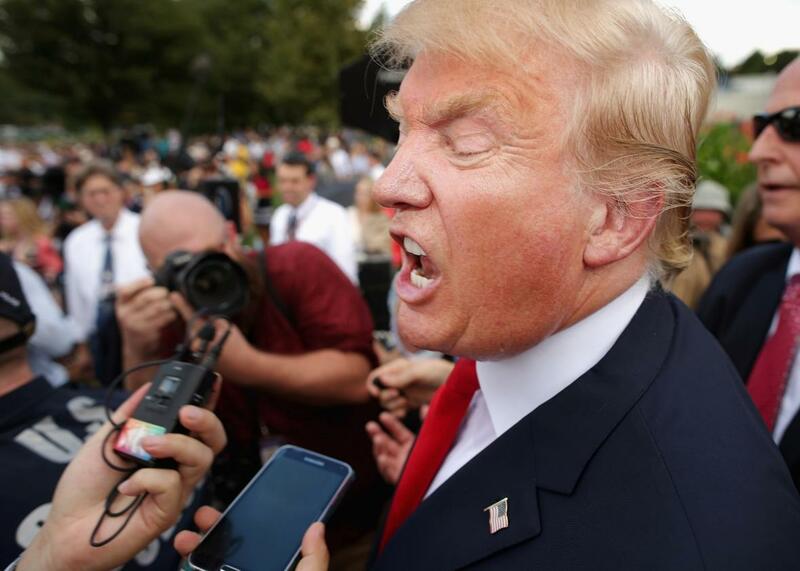 Donald Trump talks with journalists during a rally against the Iran nuclear deal at the U.S. Capitol on Sept. 9, 2015. After weeks of quiet and not-so-quiet discussions about how to derail Donald Trump, the first major conservative group has decided it can wait no longer. The Club for Growth, a powerful and deep-pocketed free-market advocacy group, announced Tuesday that its super PAC will spend $1 million on a television ad blitz in Iowa attacking the current GOP front-runner. The group has been sparring with Trump for a few weeks now on Twitter and elsewhere, but the ad buy is the first time that it or any other conservative group has decided to spend big on the airwaves in a bid to bring The Donald back to Earth. The first of the two TV spots is largely a repeat of attacks we’ve seen before: It hits Trump for his previous support of universal health care and the 2008 Wall Street bailout, and his more recent suggestion that he would hike taxes on hedge fund managers and impose tariffs on companies that outsource their manufacturing (both of which are lumped together by the ad as simply supporting “higher taxes”). “In many cases, I probably identify more as a Democrat,” Trump says in a clip from 2004 that is played twice during the 30-second commercial. There’s a certain irony to the fact that the Club for Growth is now doing the heavy lifting for a Republican establishment that is increasingly fretting about Trump’s unexpected staying power. Traditionally the group has focused most of its resources on electing fiscally conservative hardliners to the U.S. House and Senate—hardliners who have made life less than pleasant for GOP establishment leaders like John Boehner and Mitch McConnell. (The group spent big to help Rand Paul get elected in 2010 and Ted Cruz to do the same in 2012.) Still, the club has played the presidential primary game before, most notably in 2008, when it spent heavily to attack Mike Huckabee for his record on taxes and spending while governor of Arkansas. The big question, of course, is whether the Trump-targeting attacks will work. The billionaire has survived similar Republican-in-name-only digs before. Megyn Kelly and co. grilled him on his liberal past during the Fox News debate last month, and Jeb Bush and other GOP hopefuls have since leveled similar criticisms. Such attacks, though, have failed to strike a chord with Trump’s unique band of supporters, many of whom appear more attracted to the businessman’s anti-establishment anger and brash bluster than anything else. Maybe these voters simply don’t care about the party line. The fact that the new attacks are coming from a super PAC, meanwhile, will play into Trump’s ongoing criticism of his GOP rivals for being too dependent on the type of wealthy patrons that are funding their campaigns and working behind the scenes. If nothing else, the ads will provide the latest test case for whether the former reality TV star is really as immune to the laws of politics as he currently appears to be. For Republicans and their conservative allies who worry that Trump is inflicting daily damage to their eventual nominee’s 2016 chances, $1 million is small price to pay to find that out.